Don’t know if it was the nap or the fact that the sea was just too still. I only slept about 3 hrs; was out on the verandah checking the weather before 8. 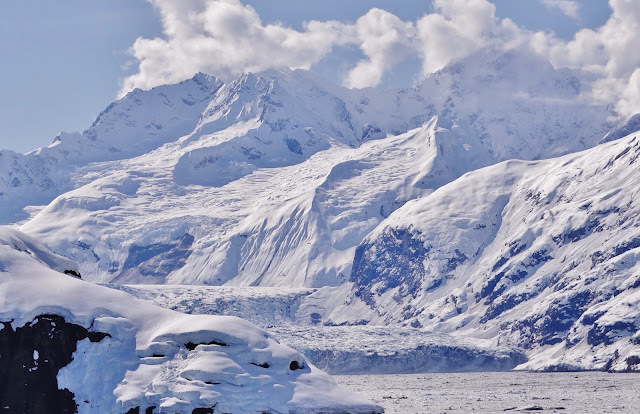 You couldn’t ask for a more perfect day for a visit to Glacier Bay National Park. There are a few high clouds; but otherwise sunny. The temps are in the low 40’s. The water is so calm that you can’t tell the reflections from the real thing. 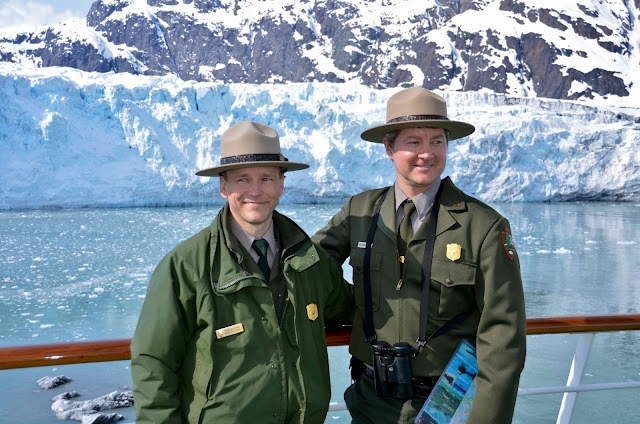 The two National Park Rangers (Tom & Sean) were already onboard & starting their day of running commentary & Q&A sessions. Ranger Tom did most of the talking over the PA system; & his enthusiasm was contagious. Throughout the day, he kept mentioning how lucky we were. He said he couldn’t remember a day with conditions this perfect; especially this early in the season. It would be another month before the summer parade of ships start their Alaska season. This was another one of those days that I was tickled to have that aft deck area at my disposal. 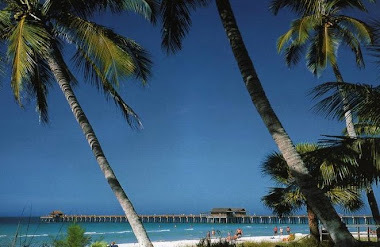 Being outdoors with a 300* view, protected from the wind; I could see more than those who were up in Palm Court. With the exception of a few crew members who drifted out there throughout the day, I had it all to myself. I packed my tote bag, pulled up a lounge chair in the sun & had a couple of steamer blankets on the ready. My first visit to Glacier Bay was in July 1992 (the peak of the Alaska season). It was an indescribable experience then; but pales in comparison to today’s. Alaska has a totally different feel with so much snow cover. There were moments today that made me misty-eyed; others that took my breath away. You could almost feel the power in all the beauty; it was almost a religious experience! About ¾ way up into the Bay, we spotted a group (don’t think there were enough of them to qualify as a herd) of mountain goats on the starboard side. You don’t usually get to see them this far down from the mountains. One would think their hooves would not provide adequate traction; & wonder why they don’t just slip over those steep ledges. But I read later that they have hooves that are split like toes; & they even have little sharp claws on the tips of their feet. Had I known that, I wouldn’t have been so nervous watching them climb. We arrived at Reid Glacier about 9:20am. The sun was so warm, I only needed a sweater. Reid Glacier is 11 miles long, quite narrow (approximately ¾ mile) & not very thick at the face (or at least what’s visible above water). It was covered with what appeared to be a layer of fresh snow. Since I don’t get to see snow very much any more, I was loving this. You tend to forget how it glistens like diamonds when the sun reflects off of it. Makes you just want to go lay down & roll around in it. The Capt. slowly turned the ship around; & as we started back out the inlet, we spotted a lone moose on the starboard side. He was sunning himself right along the edge of the water. There were a lot of tracks in the snow. So, this must be a popular spot for moose. We obviously disturbed his rest, because he slowly got up & walked away. I decided to make a quick run down to the Bistro for a capp. to go; & then ran up to the Palm Court to see who was where. That’s where a lot of the Pax were; including Betty, Kris, Celeste & Bill. Everyone was chatting & sharing the experience; dashing out those emergency exits to snap photos. It was way too crowded & noisy for me. I preferred the serenity of deck 8 aft. By the time I got back there, we were deep into Tarr Inlet to view the Margerie Glacier. Actually at this ‘dead end’, the Ferris & Grand Pacific Glaciers merge right ‘next door’ to the Margerie. It is about one mile wide; & extends upstream about 21 miles. The depth of Margerie Glacier at the face is about 350’, which makes it taller than the Statue of Liberty (both below & above the water line). 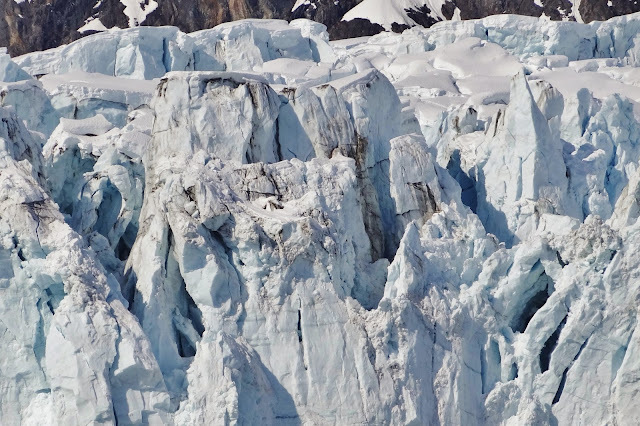 The face has a very steep drop off, a result of it being one of the most active ‘calving’ glaciers in Glacier Bay. We stayed there, dead in the water, for quite a long time. And true to its reputation, every so often you would hear that loud cracking noise which precedes ‘calving’. More & more Pax started to come out on deck 7 to listen & watch the ice fall. It’s not that easy to detect where the cracking sound is coming from. And even more challenging to scan a 1 mile wide glacier through a viewfinder, hoping to catch that magic splash. But I did, several times. It’s such an exhilarating sight! Those high clouds from earlier this morning began to move away; & the sky became a deep blue. That made it easier to see the blue ice in those deep crevices along the face. Unlike the Reid Glacier, the top of this one resembled jagged teeth. You could easily see how chucks of it would warm in the bright sun & break away. While we were in Tarr Inlet, Capt. Glenn lowered lifeboat #1; & sent (videographer) Jeff & several photographers off to shoot Serenity in front of this gorgeous backdrop. Traffic on 8 aft picked up a little. Che came out with her camera, as did several of the stewardesses. I asked Lizzie to pose with me. The wind was cold coming off the glacier; & I had to start putting layers back on. So glad I bought those ear warmers in Kodiak; they were about to freeze off. When the Capt. began to turn the ship around, I took this opportunity between glaciers to run up to the Lido for a quick lunch. I fixed a plate with grilled prawns, chicken crepes (with mushrooms, green peas, comte cheese & tomato-butter sauce), grilled filet mignon with red onion confit, hearts of palm, a sample of a few cold salads & a cup of cabbage soup. The soup & the crepe were to die for. I sat at the table with Peggy, Elaine, Janice & Pat. While I was eating, they announced that there was a group of sea lions on a cliff near the water’s edge on the starboard side. I ran over to that side with the camera. They weren’t easy to spot since they were nearly the same color as the cliffs. I took several shots; but was not sure until much later that I actually got them. After lunch, I made a stop back at the cabin to get gloves & my jacket. As we approached Johns Hopkins Inlet, I could see Mt. Fairweather off the port bow. At over 15,000’ it is by far the highest peak in this area of the park. It made a beautiful backdrop for the two-tiered Johns Hopkins Glacier. Johns Hopkins is a tidewater glacier that’s become one, since its merger with several tributary glaciers (primarily the Gilman Glacier). It’s approximately one mile wide; & stands about 450’ from top to bottom at the face. Ranger Tom continued to enthusiastically spout statistics & interesting tidbits about Glacier Bay the rest of the afternoon. I was warming up in the cabin, when Celeste came down about 2:30 to see if I was happy with the photos I got from ‘the back yard’. We went up to the Captains Choice to look for a birthday card for Betty. None to be found. I did pick up a few more bottles of my favorite deodorant (which I can only find on Crystal ships). Then I stopped by the library to get my photo prize from yesterday’s morning show. I laid down & took a little nap; & then worked on today’s photos for a few hours before dinner. Just before sunset we were making our way out of Glacier Bay; & the scenery in the late afternoon sun was beautiful. Tomorrow is Betty’s birthday; & I was happy to join my favorite people in Prego to help her celebrate. I arrived a little early; & watched the sunset out on deck as I waited for the others to arrive. Everyone was in a jovial mood, drinks flowing freely; & we were all still high from the wonderful day cruising Glacier Bay. I asked if anyone was interested in sharing a plate of bruschetta. Most didn’t know that you could order it; & it was a big hit. I know I could make a whole meal out of it. I started with an appetizer of biscotti crusted sea scallops with baby greens & lemon/black pepper aioli. Awesome! Then I had the obligatory Caesar salad; followed by the lemon & herb risotto topped with prosciutto & tiger shrimp. Bruno, along with Costas, provided excellent service; & kept the pace moving nicely. In a short while, they came out with Betty’s cake, singing happy birthday. It was a beautiful white cake with strawberries & whipped cream. Very pretty & feminine, just like Betty. At least someone at the table had shopped early & was able to find a birthday card to present to her. I felt badly that I didn’t know this when we were in Seward day before yesterday. Completely taken by surprise, Bruno comes out with another birthday cake for me. Wow, I get to celebrate again; & my birthday’s still another 4 weeks away. They were all laughing because they caught me so off guard. And they knew that I probably wouldn’t have had dinner out if it had not been a party for Betty. My cake was chocolate with chocolate ganache. And to make the story even funnier; there was much ‘ado’ about putting names on the cakes. Celeste said Bruno was so confused when she ordered the cakes. I’m registered as Emily, although most everyone knows I go by Becky. So, when she asked for a cake with Betty on it; they weren’t sure if the ‘Becky’ cake was really supposed to say ‘Betty’. And maybe there was supposed to be another cake for ‘Emily’. I haven’t laughed so much in a long time. It was a fabulous evening with a wonderful group of friends. When we parted ways outside of Prego, I think most everyone else wanted to take the party elsewhere. With so little sleep last night, it had been a long day. So, I said my goodnights. I got comfy; & went back to work on the photos until about 1am. I also watched the replay of Ranger Sean’s presentation in the Galaxy Lounge (“Finding Common Ground in Glacier Bay”) from this afternoon. I think we lucked out having the two of them onboard today. They (along with Capt. Glenn) kept an eagle out for wildlife up on the bridge; & we were lucky to see things most people never have the opportunity to see. They are very proud of ‘their’ park; & they made the experience all the more special for the rest of us. Kudos to Tom & Sean! Glad you had such a wonderful day in Glacier Bay. Your photos are amazing. Your birthday cake and the risotto look yummy!